We are delighted to announce that our business SGS Systems Ltd has recently re-located from Pattingham to our new business address at: 81 Wergs Road, Tettenhall, Wolverhampton, West Midlands WV6 9BP. Our new office creates a central point of contact. Locally we offer a prominent location for our customers to meet us, whilst further afield, we provide a central bases for our SGS Systems Ltd security engineers to have clear access to all major motorway routes across the UK. Don’t forget we’re here to help with your property security! Supplying and installing security to both homeowners and commercial business properties throughout the West Midlands, Staffordshire and Shropshire and across the UK, our company SGS Systems Ltd is first on hand to help and support with property security. From single wired and wireless burglar alarms to multi-alarm networks. 24/7 monitored CCTV security or fog and smoke security, our company provides are range of both internal and external security systems to secure premises and suit your protection needs. To find out more please contact our property security team or see our house security and commercial security website pages for further information. Manufacturers play a key role in many supply chains, whether they are producing an element of a product or providing an assembly process for a finished item and so how they operate their manufacturing security is key to this. Securing raw materials, stock and equipment is essential to the daily running and productivity of any manufacturing business. Theft or damage to stock can cease a manufacturing business and bring a complete supply chain to a standstill. Ensuring that a manufacturing premises, the stock that they hold and the equipment is safe during work hours and away from the premises will give company Director’s peace of mind that their business is safe. Here at SGS Systems Ltd we support manufacturing businesses across the West Midlands and the UK to ensure that their businesses operate with fully protected manufacturing security. A manufacturing premises can develop in all shapes and sizes from small independent units to large multi building operations. Here at SGS Systems Ltd we provide a range of manufacturing security options which are individually bespoke to suit each business, depending on their scale and the types of products that they manufacture. What does our manufacturing security include? Commercial Alarms – SGS Systems Ltd install and regularly maintain commercial alarm systems. Our commercial alarms systems are hardwired into the premises and operate using their own network. Door entry systems – The installation of an SGS Systems Ltd door entry system is ideal for companies who wish to zone off areas within a manufacturing premises. Perfect for areas where substantial amounts of stock is stored or where only designated staff is allowed entry. CCTV cameras and equipment – 24/7 internal and external surveillance at a commercial property offers continual monitoring and acts as a deterrent. Linked to a telephone app, cameras can be monitored whilst on site or away from the premises. For more information on our manufacturing security options and to discuss the commercial security of your business in confidence, please speak to our SGS Systems Ltd security team to find out how we can support your company. Spring is here! Is the perimeter of your outdoor property safe? 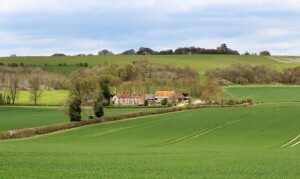 As the weather begins to warm up and we begin to spend more time outdoors, it’s time to start thinking about the safety and security of the perimeter of our homes and outdoor property such as sheds and outbuildings. Sheds that were once just used to store a lawn mower and the odd few pots of paint or offer a place for ‘Dad to go to’ are long gone. These days they are used to house far more sophisticated possessions that come at a much higher cost. They have become an extension to the living area of our homes and our personalities, hobbies and interests, offer a useful space for storage so that we may keep our houses clutter free. 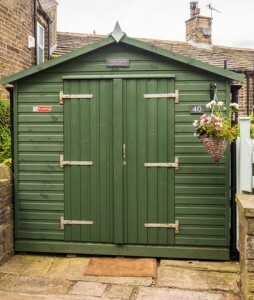 Bikes and hi-tech sports equipment, storage for hot-tubs and high quality garden furniture, or extra space for office use and hobby businesses are just some of the reasons why homeowners of today wish to invest in outdoor property such as a shed or summer house. With the influence of George Clarkson’s TV programme ‘Amazing Spaces’ and now paint brand Cuprinol who host their annual competition ‘Shed of the Year 2019’, how we build and use a shed has opened the minds of many homeowners across the UK. So how can we protect our beloved shed, cabin, garden room or summer house? Add frosting or curtains to the windows to minimize visibility through the glass to prevent an intruder from seeing what’s inside. Install a wireless burglar alarm from SGS Systems Ltd. Connected via your home WIFI and accessible through a smart-phone app gives the ability to homeowners to easily set and manage the alarm when they are away from the property. Install CCTV security from SGS Systems Ltd. Connected through a dedicated TV monitor and accessible through a smart-phone app offers homeowners the freedom to check on their outdoor property 24 hours a day, 7 days a week. It is no secret that organized gang crime is on the rise across the UK. 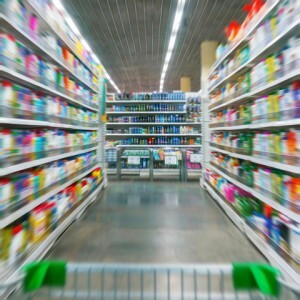 Whilst it is often referred to in conjunction with drugs and weapons, the UK has also seen a noticeable rise in predatory gangs who are raiding retail stores and warehouses across the country. Whilst final figures for 2018 are still yet to be published, during 2017 retail crime rose to £700 million according to the Retailers Against Crime partnership. Mass theft of substantial quantities of product which can be sold without trace on the black market has become a growing trend. Fraud and commodities such as clothing, electrical items, alcohol and cigarettes still continue to lead their targeted wish list. And it is not just UK gangs. The UK is being targeted more than ever by organised international gangs who see us as a wealthy country and have recognized theft opportunities. This isn’t helped by our under-funded Police infrastructure which has been determined as not able to withstand and appropriately respond to the pressure of modern day global criminals. So what can be done to help commercial businesses who need to protect against gang crime? Finding support for retailers – Support organizations like the Retailers Against Crime partnership (https://www.retailersagainstcrime.org) provide training and useful resources to help retailers to recognize organized and travelling offenders. Lighting – A well lit property is less of an easy target to gangs who are looking to go undercover. Sensor lighting which can be triggered in a disturbance could deter intruders from making any attempt to enter any further. Protecting your premises with Fog Security – Premises security is crucial in securing zones and protecting stock. Fog / Smoke security offers the most capable method to combat against this. Filling a room in seconds with thick, dense fog, will not only take thieves by surprise, it will completely dis-orientate them and minimize any theft of goods. CCTV Monitoring equipment – Clearly displaying that CCTV monitoring equipment is in use can be a deterrent to opportunists. However should an issue arise, then real-time imagery of the incident will be captured and could be used as future evidence. Alarming your premises – Installing a fully operational accredited commercial alarm and having it continually serviced and maintained, gives owners peace of mind that their premises is safely protected whilst they are away from the site. Do you own commercial property and operate as a retailer, a warehouse premises or a you the owner of a manufacturing / industrial business? Here at SGS Systems Ltd we assist companies with commercial security – large or small and stretching across the UK. 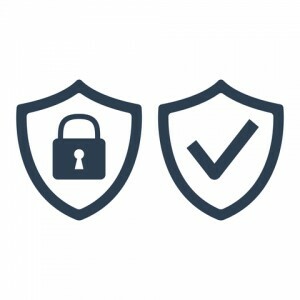 Tailored specifically to individual business needs we supply and install the right security solution to protect your company, your goods and your premises. To find out more please contact our commercial alarm security team or see our commercial security website for further details. As we settle in to 2019 here at SGS Systems Ltd, we thought that it would be a great idea to hand out a security checklist to all of our contacts and put everyone on the right track for 2019 in terms of their house security. Ensuring that your home is continually kept safe should be a priority but can sometimes goes un-noticed when there are so many other home improvements to pay out for. However, according to an article published during last November 2018 by DIYweek.net – Brits were set to spend £29.6billionon home improvements by the year-end of 2018. This is an astonishing figure and a trend that is continually increasing as more homeowners look to improve the condition and aesthetic look of their property which not only reflects their taste but can also increase the overall value of their property. So if home owners are investing substantially in their properties, then we suggest, that so too should they invest in their home security to protect their hard work and investment. Replace windows with key lock windows – Most modern windows will be fitted with locks. If you don’t have locks then it is certainly worth considering. Creating an extra barrier and decreasing opportunity to prize open a window is a useful deterrent. Replace external doors with a multi-point locking system – Multi-point locks provide a more substantial locking system and deter opportunists. Look at the quality of your doors and their frames and check that they are in good condition. Improve the security to your garages and sheds and invest in CCTV security – These spaces can hold valuable vehicles and equipment, however they are easy targets for intruders as they are not always secure. Ensure that locks and padlocks are in good working condition and upgrade to an enhanced option wherever possible. Protecting your outdoor space with visible CCTV surveillance supplied by SGS Systems Ltd will provide 24/7 external monitoring of your external space, especially in areas which are out of regular view. Clear up your garden – Hedges, shrubs and trees can obscure vision and shield intruders. Trimming and tidying up your garden will not only improve the overall look of your property but will also provide clear visibility around it’s perimeter. Install a home security alarm – For homeowners that don’t have a house alarm then maybe it’s time to consider installing a house security system? Here at SGS Systems Ltd our highly trained security engineers install and maintain security equipment through our SSAIB accreditation. To find out more please contact our security advisors today to book a confidential security review of your property. Happy New Year! This January 2019 we are delighted to inform homeowners across the West Midlands, Staffordshire and Shropshire regions about our Winter Home Security offer. For just £60.00, SGS Systems Ltd can give your existing house alarm a security review to make sure that your property is safe. The great aspect about our Winter Home Security offer, is that you don’t have to have an SGS System’s Ltd alarm fitted! This means that our qualified team of alarm engineer staff and company experience of over 25 years can survey other branded house alarms, which is perfect for homeowners who may have recently moved into a property or for those who have lost contact with their original alarm installation company. Here at SGS Systems Ltd, we service, maintain, repair and supply many varieties of house alarms, all of which will suit the size and nature of the property, whilst meeting the needs of our customers. As SSAIB and Insurance accredited suppliers of property security equipment, we protect property buildings, both inside and out and can work with existing house alarm systems or upgrade and supply new security equipment. How to book our Winter Home Security offer? 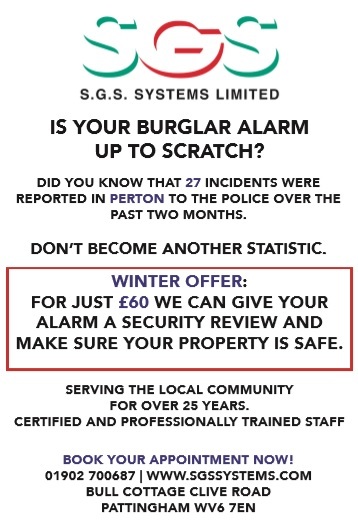 To book an appointment for our £60 Winter Home Security offer please contact us at sgssystems.co.uk or call 01902 700 687. Alternatively, to find out more about our home security options including wired and wireless house alarms, 24/7 CCTV monitoring cameras and CCTV equipment or the installation of our fog security please see our website: sgssystems.co.uk. Christmas security – Prime time for potential burglars! Expensive gadgets, clothes, perfume and jewellery often make popular Christmas list items. These types of Christmas present’s offer easy opportunities to burglars who can grab when making a quick getaway and can sell on quickly – making them easily untraceable. 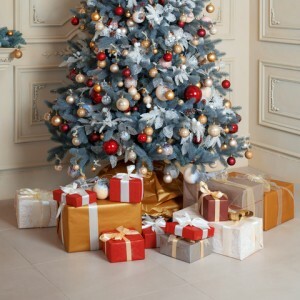 Presents Under Tree – Don’t leave expensive gifts visible under the tree during the weeks leading up to Christmas. Storing them safely out of sight will deter burglars from breaking into your home if they are looking for items to quickly grab from under the tree. Outdoor Christmas Lights – These are becoming more and more popular across the UK as homeowners light up their homes and gardens with magical Christmas scenes. The issue is that often they don’t have an external power socket and so they trail extension leads through their windows. This prevents them from shutting the windows securely and provides a prime target to intruders. Not only do the lights draw attention to the potentially vulnerable house, but there is also a good chance that their window may be left on the catch, creating easy opportunity for burglars to gain access. Curtains and Blinds – Keep these closed at dusk and at night to minimise drawing attention and peering eyes into your home well-lit home. Installing lights on a timer will give the impression that the house is occupied even if you are not at home. Going Away This Christmas? – Cancel newspaper and milk deliveries. Ask a neighbour to park their vehicle on your drive so that it gives the impression that your home is occupied. Put your bins out for collection and ask a neighbour to return them to your property once empties. Ask a neighbour to keep an eye on the house and either push post fully through the letterbox or collect your post from your porch and store safely until you return. Using Social Media – Don’t boast on social media about expensive gifts you have received or promote that you are off on your holidays for Christmas. Wait until you return home after your holiday and then upload your photos. Book a Christmas security review – Taking care of your existing installed alarm and giving it some TLC could be the best Christmas present that you give yourself and your family this Christmas. If you have an alarm but it is not maintained by SGS Systems Ltd, then we can still help! Under our Christmas security review, we will carry out a security review of your existing alarm to keep you safe this season. 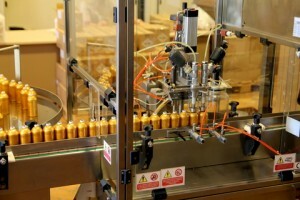 For more information please contact us on 01902 700687 or see our website www.sgssystems.co.uk. Providing house burglar alarms, CCTV, smoke security and much more, we support homeowners and commercial business proprietors across the west midlands, staffordshire, shropshire and the UK with property security.